You've invested in your platform so it fits your business. We provide the integrations to help you make the most of your existing system. Your online digital store with all your integrations in one place. Browse a catalog of Fidelity solutions and more than 100 third-party integrations, so you can choose the appropriate mix for your technology platform. For more information or to find out how to access the Integration Xchange digital store fill out the Let's Get Started form below. For access to the digital store contact your Relationship Manager or Fidelity Representative. 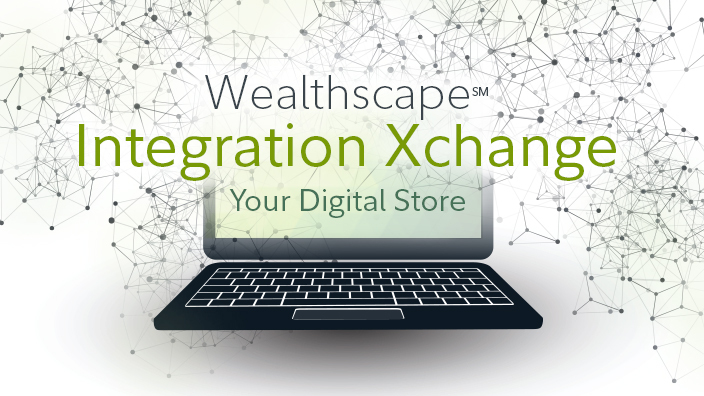 You can choose from Fidelity Integration Services that provide direct access to Wealthscape, or you can select from an array of Third-Party Tools. Note: The solutions described feature both Fidelity and third-party resources. You can customize your platform with technology products and services that deliver a wide range of options to receive data and perform transactional functions. Our Digital Store gives you the flexibility to explore and test the integrations, and simplifies your deployment process. Embed brokerage data and functionality in your platform for real-time retrieval and processing. Link or place certain Wealthscape pages directly into your own site navigation. Data transmission files generated from a core brokerage system and sent to Fidelity Clearing & Custody Solutions® or third-party service providers. A file delivery solution that provides near real-time processing for the submission of high-volume data and transactional records. Integration services for customers of Fidelity Clearing & Custody Solutions® who use Financial Information eXchange (FIX) and third-party order management systems. Uses common security protocols across integration services and the platform. Contact your Relationship Manager or Fidelity Representative for access to the digital store. Select from more than 100 third-party solutions and find the integrations that are the most appropriate for your existing platform. eMoney Advisor LLC is a Fidelity Investments company and an affiliate of Fidelity Brokerage Services LLC and National Financial Services LLC. Third-party marks are the property of their respective owners; all other marks are the property of FMR LLC. Third-party companies are independent and unaffiliated with Fidelity Investments. Listing them does not suggest a recommendation or endorsement by Fidelity Investments.